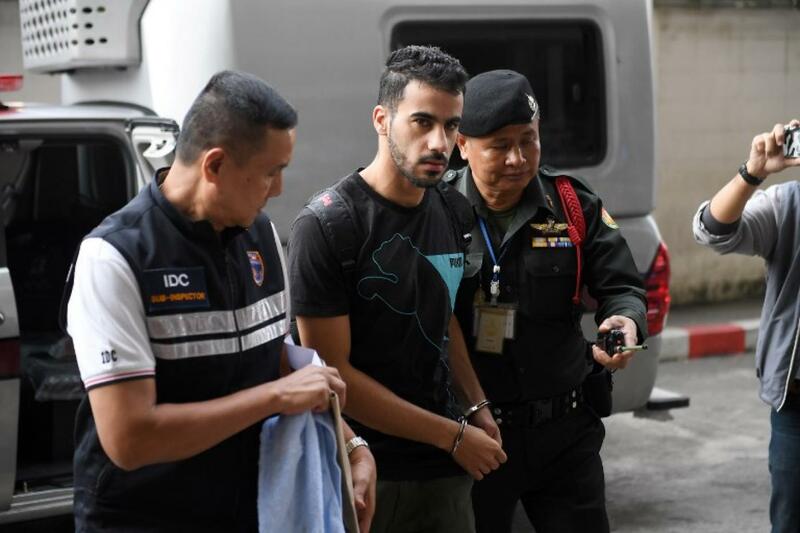 A refugee footballer fighting an extradition request pleaded for his freedom Monday, saying “please don’t send me to Bahrain” as he arrived in shackles at a Bangkok court, which extended his detention by another two months. Araibi was convicted in absentia on charges of vandalizing a police station in Bahrain, but says he was out of the country playing in a match at the time of the alleged offense. The player has said he believes he is being targeted over his criticism of Asian Football Confederation (AFC) president Sheikh Salman bin Ebrahim Al Khalifa, a member of Bahrain’s ruling family. Araibi was stopped at Bahrain’s request at a Bangkok airport in November when he arrived in Thailand for his honeymoon. He has been held in detention since then as Thai courts decide whether to send him back to the Gulf state. “Your wife sends her love! Hakeem, Australia is with you, mate,” Foster shouted. “We are asking the Prime Minister to allow Hakeem al-Araibi to return to Australia,” Australian ambassador-designate Allan McKinnon reiterated Monday outside the court, adding that representatives of 15 other countries were present to observe the proceedings. Araibi had played for Bahrain’s national youth team before he fled his homeland and was granted asylum in Australia where he plays for the semi-professional club Pascoe Vale FC. FIFA’s head of sustainability and diversity, Federico Addiechi – who was present for the hearing – told reporters FIFA has had numerous exchanges on the “formal and informal level” with Bahrain, Thailand, Australia, and the AFC. “We want to show our support to him… to ensure the right thing happens and (Hakeem) goes back to Australia as soon as possible,” Addiechi said. Araibi violated the terms of his bail the statement said and has “the right to appeal” his conviction. As Venezuela sinks deeper into the political crisis, hundreds of thousands of refugees and migrants continue to flee the country contributing to the largest population movement in the recent history of Latin America. Many of them settle in the region, in countries like Colombia, Brazil, and Ecuador, which have been generally welcoming of the Venezuelans and have shown hospitality and solidarity. “In recent days, however, violent actions, physical and verbal attacks and threats against Venezuelan citizens in several countries in the region have marred this picture,” Eduardo Stein, Joint U.N. Refugee Agency (UNHCR) – International Organization for Migration (IOM) Special Representative for Venezuelan refugees and migrants, said in a release on Monday.